This is an amzing news i have read about Yadagirigutta Temple land's encroachment in Times of Inida, the news is as follows with related link. 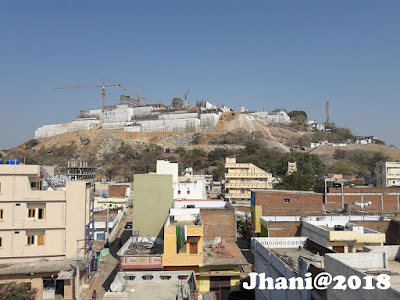 HYDERABAD: Fourteen hundred acres of land in Banjara Hills belonging to the endowments department managed by Laxminarasimha Swamy temple, Yadagirigutta, has shrunk to five acres in five decades as a result of rampant encroachment. Several colonies and institutions have come up on the temple land, which would now be worth thousands of crores. Ironically, the state government has allotted the land to several government institutions, including a school, and a crafts institution. Waking up from its slumber after several decades and realising this loss of property, the endowments department 10 days ago filed a complaint against the Shaikpet tahsildar for not implementing a ‘muntakab’ (an official order by the then Nizam government) and land grabbing cases against management of a place of worship in the Special Court for Land Grabbing (Prohibition) cases. The special court was set up under the AP Land Grabbing (Prohibition) Act 1982. A retired high court judge acts as chairman of the court. It has both civil and criminal jurisdictions. The Nizam’s Prime Minister Maharaja Kishen Pershad donated 1459.38 acres located in Shaikpet village (now on Road No 12, Banjara Hills) to the temple for its maintenance. A Narasimhaswamy temple was also constructed on the land.